The ataxia telangiectasia-mutated (ATM) gene plays a pivotal role in the maintenance of genomic stability. Although it has been recently shown that antioxidative agents inhibited lymphomagenesis in Atm−/− mice, the mechanisms remain unclear. In this study, we intensively investigated the roles of reactive oxygen species (ROS) in phenotypes of Atm−/− mice. Reduction of ROS by the antioxidant N-acetyl-l-cysteine (NAC) prevented the emergence of senescent phenotypes in Atm−/− mouse embryonic fibroblasts, hypersensitivity to total body irradiation, and thymic lymphomagenesis in Atm−/− mice. To understand the mechanisms for prevention of lymphomagenesis, we analyzed development of pretumor lymphocytes in Atm−/− mice. Impairment of Ig class switch recombination seen in Atm−/− mice was mitigated by NAC, indicating that ROS elevation leads to abnormal response to programmed double-strand breaks in vivo. Significantly, in vivo administration of NAC to Atm−/− mice restored normal T cell development and inhibited aberrant V(D)J recombination. We conclude that Atm-mediated ROS regulation is essential for proper DNA recombination, preventing immunodeficiency, and lymphomagenesis. Ataxia telangiectasia (A-T)3 is an autosomal recessive disorder characterized by immunodeficiency, progressive cerebellar ataxia, oculocutaneous telangiectasia, defective spermatogenesis, premature aging, and a high incidence of lymphoma (1, 2). A-T is caused by the mutational inactivation of the A-T-mutated (ATM) gene. ATM protein, which is a kinase related to PI3K (3), is activated by breaks in DNA or chromatin induced during meiosis or by oxidation (4). ATM activation in turn activates proteins such as p53, Chk2, Brca1, and Nbs1 that inhibit or modulate the cell cycle. ATM also controls the thiol-dependent histone acetylase-deacetylase system and may be involved in oxidative defense (5). Cells derived from A-T patients and Atm−/− mice show defects in cell cycle checkpoints in response to ionizing radiation (IR) (1, 2). Both A-T patients and Atm−/− mice show humoral and cellular immune defects, including thymic hypoplasia, a low number of T cells, and deficiencies in Ig levels (6, 7, 8). It was originally believed that ATM was not essential for V(D)J recombination in T and B cells, a process mediated largely by the nonhomologous end-joining (NHEJ) pathway of DNA repair (9, 10). However, several studies show that Atm prevents interchromosomal translocations arising from aberrant V(D)J recombination (11, 12). Furthermore, Bredemeyer et al. (13) recently reported that ATM functions directly in the repair of chromosomal DNA double-strand breaks (DSBs) in repair complexes generated during lymphocyte Ag receptor gene assembly. However, it remains unclear how ATM contributes to development of lymphocytes and prevention of lymphoma. It has been shown that impaired ATM function leads to defects in control of reactive oxygen species (ROS). It has been reported that the level of oxidative stress increases in tissues from A-T patients or Atm−/− mice (5), although the mechanism by which ATM regulates ROS level is unclear. Furthermore, abnormalities in the levels and function of antioxidant systems in A-T cells have been reported. It is assumed that increased ROS or abnormal response to ROS may contribute to neurodegeneration and premature aging observed in A-T patients. We previously reported a critical role for Atm in stem cell self-renewal due to its effects on ROS regulation during hemopoiesis (14). Furthermore, treatment with the antioxidative agent N-acetyl-l-cysteine (NAC) prevents bone marrow failure observed in Atm−/− mice (14). Loss of control of ROS levels is critical for clinical and cellular phenotypes associated with tumor-prone disorders. Schubert et al. (15) reported that treatment of Atm−/− mice with the antioxidant Tempol (4-hydroxytetramethy-l-piperidine-1-oxyl), doubled their lifespan by delaying the onset of thymic lymphoma, indicating that tumor development is partially caused by increased ROS. Furthermore, Reliene et al. (16) reported that NAC treatment also prevented the lymphomagenesis, accompanied by suppression of carcinogenesis-associated biological markers, such as DNA deletions and oxidative DNA damage. These data prompt us to investigate effects of antioxidative agent on the development of pretumor lymphocytes in Atm−/− mice. In this study, we investigated the effect of antioxidation mediated by NAC on phenotypes seen in Atm−/− mice. NAC is a thiol-containing compound that nonenzymatically interacts with and detoxifies reactive electrophiles and free radicals. NAC treatment is clinically beneficial in conditions characterized by oxidative stress (17). In this study, we showed that NAC treatment prevented impairment of Ig class switch recombination (CSR) in B cells and restored normal T cell development and inhibited aberrant V(D)J recombination. These findings indicate that Atm-mediated ROS regulation is essential for the proper response to DSB. Atm+/− mice (C57BL/6) were a gift from P. J. McKinnon (St. Jude Children’s Research Hospital, Memphis, TN). Offspring of intercrosses were genotyped using PCR-based assays of tail DNA. Littermates were used as controls in all experiments. Animal care in our laboratory was in accordance with the guidelines for animal and recombinant DNA experiments in Keio University and Kanazawa University. For in vivo treatment, NAC in drinking water (1 mg/ml) was administered to WT or Atm−/− mice. Primary MEFs were derived from WT or Atm−/− embryos at E14.5. MEFs were cultured in DMEM supplemented with 10% FCS, 5 mM glutamine, 50 μM 2-ME, 100 U/ml penicillin, and 100 μg/ml streptomycin at 37°C in a humidified atmosphere containing 5% CO2. For NAC experiments, MEFs were incubated with 100 μM NAC (Sigma-Aldrich). SA-β-gal staining was performed according to the manufacturer’s protocol (Cell Signaling Technology). The following mAbs purchased from BD Pharmingen were used for flow cytometric analyses: Thy1 (53-2.1), CD3, CD4 (L3T4), CD8 (53-6.72), B220 (RA3-6B2), CD43, IgM, IgG1, TCRαβ, or TCRγδ. Total IgA, IgG1, IgG2a, IgG3, IgM, and IgE were measured using an Ig Detection Kit purchased from Southern Biotechnology Associates, as described previously (18). G1 arrest was examined in murine embryonic fibroblasts (MEFs) as described previously (19). MEFs were synchronized at G0 by incubation for 4 days in DMEM containing 0.1% serum. The G0-synchronized cells were trypsinized and resuspended in growth medium containing 65 μM BrdU. The cells were irradiated with 0–20 Gy of x-ray, replated, and cultured for 24 h before fixation in 70% ethanol. Cell were then stained with anti-BrdU Ab (BD Pharmingen) as described previously (19). Enriched populations of splenic B cells were obtained using magnetic anti-CD19 beads according to the manufacturer’s instructions (BD Pharmingen). Cells (2 × 105) were plated in 24-well flat-bottom plates in 1.0 ml of complete medium consisting of RPMI 1640 (Invitrogen Life Technologies) supplemented with 10% FCS, 1% sodium pyruvate, 1% nonessential amino acids, 0.5% l-glutamine, 5 × 10−5 M 2-ME, 100 U/ml penicillin, and 100 μg/ml streptomycin, and incubated at 37°C in 5% CO2. To induce specific Ig class switching, B cells were stimulated as follows: for IgG1, IgG2a, and IgM, the stimulus was 2.15 μg/ml mouse membrane CD40L (PeproTech) plus 1,000 U/ml recombinant mouse IL-4 (PeproTech); for IgG2b and IgG3, the stimulus was 15 μg/ml LPS (Sigma-Aldrich) as described previously (18). Culture supernatants were harvested on day 6 for quantitation of Ig classes by ELISA as described above. Genomic DNA (1 μg) isolated from cultured B cells was digested by EcoRI (Nippon Gene) overnight, and 100 ng was self-ligated overnight using T4 DNA ligase (TAKARA) in a 50 μl volume as described previously (18). Ligated DNA was subjected to two rounds of PCR using nested primer pairs for DC-PCR of Sμ-Sγ1, Sμ-Sε, and a nicotinic acetylcholine receptor (nAChR) as a control. Primer sequences are as follows: Sμ-Sγ1 1st forward, 5′-gagcagctaccaaggatcaggga-3′ and Sμ-Sγ1 1st reverse, 5′-cttcacgccactgactgactgag-3′; Sμ-Sε1 1st forward, 5′-cgggtattggaaaataattgaatg-3′ and Sμ-Sε1 1st reverse, 5′-gcagagcatcctcacataca-3′; nAChR 1st forward, 5′-gcaaacagggctggatgaggctg-3′ and nAChR 1st reverse, 5′-gtcccatacttagaaccccagcg-3′; Sμ-Sγ1 2nd forward, 5′-ggagaccaataatcagagggaag-3′ and Sμ-Sγ1 2nd reverse, 5′-gagagcagggtctcctgggtagg-3′; Sμ-Sε1 2nd forward, 5′-gtccttcaatttcttacataacc-3′ and Sμ-Sε1 2nd reverse, 5′-atgcaggatagaccccagac-3′; nAChR 2nd forward, 5′-ggactgctgtgggtttcacccag-3′ and nAChR 2nd reverse, 5′-gccttgct tgcttaagaccctgg-3′. Eight-week-old mice were irradiated in an x-ray irradiator (Hitachi; MBR-1520R-3) at a rate of 0.5 Gy/min in a single dose of 8 Gy, and survival was determined. Cells were loaded with 5 μM 2′-7′-dichlorofluorescene diacetate (DCF-DA) (Sigma-Aldrich) and incubated on a shaker at 37°C for 30 min (14). The peak excitation wavelength for oxidized DCF was 488 nm and emission was 525 nm. For RT-PCR, analysis of germline and productive IgG1 and IgE transcripts in B cells were activated in vitro as described previously (18). The cDNA from total RNA was used in PCR. Primer sequences were as follows: germline Igγ1 forward, 5′-tcgagaagcctgaggaatgt-3′ and germline Igγ1 reverse, 5′-atagacagatgggggtgtcg-3′; germline Igε forward, 5′-ctggccagccactcacttat-3′ and germline Igε reverse, 5′-cagtgcctttacagggcttc-3′; productive Igγ1 forward, 5′-tcgagaagcctgaggaatgt-3′ and productive Igγ1 reverse, 5′-atagacagatgggggtgtcg-3′; productive Igε forward, 5′-ttggactactggggtcaagg-3′ and productive Igε reverse, 5′-cagtgcctttacagggcttc-3′. For intra- and interchromosomal rearrangements, genomic DNA (100 ng) derived from (wild-type) WT and Atm−/− thymocytes was used for PCR amplification. The PCR conditions were essentially as described in Lista et al. (20). Primer sequences are were follows: TCRGV3S1a, 5′-accatacactggtaccggca-3′; TCRGJ1/2a, 5′-tcatcactggaataaagcag-3′; TCRBV5S1b, 5′-ttctcagtccaacagtttgat-3′; TCRGV3S1b, 5′-acccctacccatattttcttag-3′; TCRBJ2a, 5′-tctactccaaactactccag-3′; TCRBV5S1a, 5′-tggtatcaacagactcagggg-3′; TCRBJ2b, 5′-cctccaagcgaggagatgtgaa-3′; TCRGJ1/2b, 5′-ggtacttaccggagggaatt-3′. Sμ-S1 junctions were amplified from genomic DNA as described previously (18). MEFs at passage 6 were arrested at mitosis by treatment with 0.002 μg/ml colcemid for 2 h. Metaphase spreads were prepared by standard procedures and stained with 4′,6′-diamidino-2-phenylindole, Hoechst 33258, and quinacrine mustard for identification of individual chromosomes. Over 100 cells were subjected to analysis. The p values for most experiments were calculated using the unpaired Student’s t test. Statistical differences in Kaplan-Meier survival curves were determined using the log-rank rest (p < 0.005). To evaluate base levels of ROS in cells of Atm−/− mice, we measured H2O2 concentrations in MEFs derived from WT and Atm−/− mice. MEFs from untreated Atm−/− mice showed a much higher base level of H2O2 than did WT MEFs (Fig. 1⇓A). NAC treatment did not affect WT cells but did dramatically reduce ROS levels in Atm−/− MEFs. We then evaluated the effects of NAC on MEF proliferation. Although MEFs derived from WT E14.5 embryos proliferate rapidly at early passages, the growth rate slows over 10 passages such that cells eventually stop dividing. Untreated Atm−/− MEFs showed no defects in proliferation at the early stages (passage 2), grew at a reduced rate at later passages (passage 6), and underwent complete growth arrest by passage 10 (Fig. 1⇓B). However, when proliferating Atm−/− MEFs were treated with NAC, they maintained WT rates of proliferation at passages 2 and 6 and showed a significant proliferation even at passage 10. Abnormalities in cell morphology were also mitigated by NAC. By passage 10, untreated WT MEFs exhibit elongated, spindle-shaped, fibroblastic morphology, whereas untreated Atm−/− MEFs show a refractile cytoplasm with flat, enlarged morphology. Unlike WT MEFs, untreated Atm−/− MEFs also stained positively for a senescence-associated β-galactosidase (SA-β-gal) (Fig. 1⇓C). NAC treatment prevented the appearance of these senescence-associated phenotypes in late passage Atm−/− MEFs. Karyotypic analysis of MEFs at passage 6 revealed that the frequency of chromosomal aberrations was higher in untreated Atm−/− MEFs than in WT MEFs, as reported previously (21). Importantly, NAC treatment prevented chromosomal abnormalities in Atm−/− MEFs (Fig. 1⇓D). However, NAC treatment could not rescue the impaired G1/S checkpoint seen in Atm−/− MEFs (Fig. 1⇓E). These results indicate that chromosomal instability seen in Atm−/− MEFs, but not the defective G1/S checkpoint, is caused by ROS elevation. 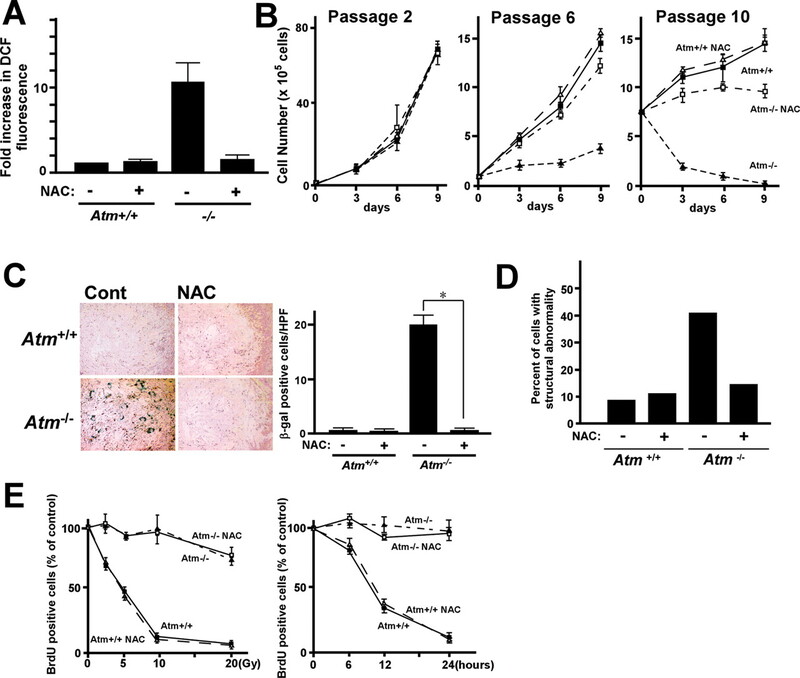 Prevention of premature senescence in Atm−/− MEFs by NAC. A, Reduction in H2O2 levels. Cultured WT and Atm−/− MEFs were analyzed for levels of intracellular H2O2 as determined by DCF-DA. H2O2 concentrations in Atm−/− MEFs were restored to WT levels by treatment with 100 μM NAC. Results are expressed as the mean ± SD of the ratio of DCF fluorescence of MEFs to those in nontreated WT MEFs (n = 3). B, Prevention of growth arrest. WT and Atm−/− MEFs were maintained in replicate cultures with or without NAC, and cell numbers were determined using a Coulter counting on the indicated days. Proliferation curves are shown at passages 2, 6, and 10. Results are the mean cell number ± SD of five plates for each time point. C, Decrease in SA-β-gal-positive cells. Cultures of WT and Atm−/− MEFs, with or without NAC, were examined for the presence of SA-β-gal-positive cells (indicating premature senescence). Left panel, SA-β-gal staining; right panel, quantitation of data. Results are the mean number ± SD of SA-β-gal-positive cells per high-power field (HPF) (n = 3). D, Reduced frequency of chromosomal instability. WT and Atm−/− MEFs at passage 6 were treated with or without NAC, and metaphase spreads were assessed for the frequency of chromosome aberrations. Data shown are the percentage of cells in a culture showing structural abnormality and are representative of three independent experiments. E, Lack of rescue of the G1/S checkpoint in Atm−/− MEFs by NAC. Passage 2 WT and Atm−/− MEFs, with or without NAC, were synchronized in G0 by serum starvation, exposed to IR, and incubated with BrdU. Entry into S phase was evaluated by flow cytometry using anti-BrdU Ab. Left panel, mean percentage ± SD of BrdU-positive cells (expressed as the percentage of control nonirradiated cells) 24 h after the indicated dose of IR (n = 3). Right panel, Mean percentage ± SD of BrdU-positive cells at indicated time points after exposure to 20 Gy IR (n = 3). Next, we investigated roles of ROS regulation on phenotypes of Atm−/− mice in vivo. To do so, NAC was administered in the drinking water of Atm−/− mice. Untreated Atm−/− mice weighed significantly less than WT mice, as reported previously (6, 7, 8). NAC treatment did not affect somatic growth of Atm−/− mice (data not shown). It was reported previously that Atm−/− mice showed hypersensitivity to total body irradiation (6), indicating that Atm loss leads to an abnormal response to DNA damage. When adult mice were subjected to IR treatment at the level of 8 Gy, all Atm−/− mice died within a week, whereas WT mice died slowly, as previously reported (6) (Fig. 2⇓A). However, when mice were treated with NAC in vivo, the early death of Atm−/− mice by IR was significantly inhibited. The death of Atm−/− mice by irradiation resulted from acute radiation toxicity to the gastrointestinal tract. Epithelial crypt degeneration observed in the small intestine of these mice was inhibited by NAC treatment (Fig. 2⇓, B–D). These data demonstrate that abnormal in vivo responses to IR seen in Atm−/− mice can be rescued by ROS suppression. Inhibition by NAC treatment of acute sensitivity of Atm−/− mice to IR. A, Survival curves of WT and Atm−/− mice with or without in vivo treatment of NAC after 8 Gy of x-ray irradiation (n = 6 each group). The difference between Atm−/− mice plus and minus NAC is statistically significant (Wilcoxon two-sample test assuming nonparametric data and a two-tail p value, p < 0.05). B and C, H&E-stained sections of the small intestine taken at day 4 after 8 Gy irradiation are shown. WT (B), Atm−/− (C), Atm−/− with NAC (D). Schubert et al. (15) and Reliene et al. (22) reported that treatment of Atm−/− mice with the antioxidants extend their lifespan by delaying the onset of thymic lymphoma. To confirm the role of elevated ROS in Atm-related lymphomagenesis, we administered NAC in drinking water from birth to WT and Atm−/− mice. We confirmed that NAC treatment reduced ROS levels in lymphocytes in vivo (Fig. 3⇓). 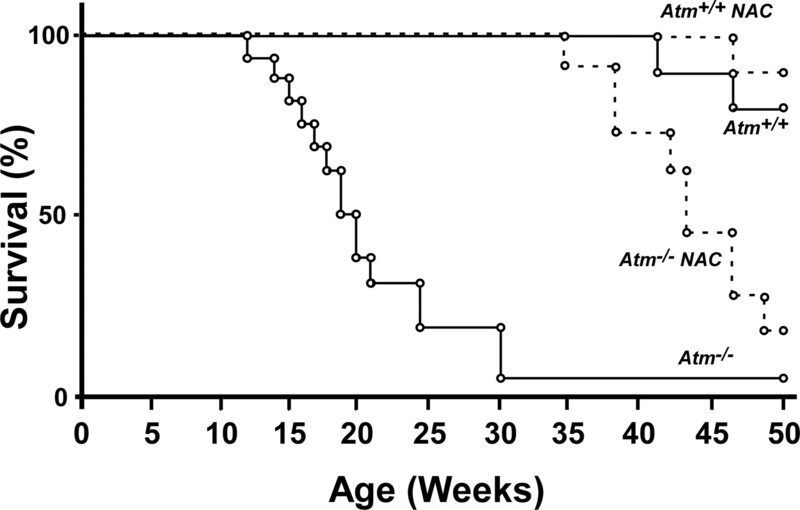 As expected, untreated Atm−/− mice began dying of lymphoma at 10 wk of age, and only 30% survived until 24 wk (Fig. 4⇓). Strikingly, NAC treatment significantly prevented lymphomagenesis in Atm−/− mice. Reduced ROS in vivo in Atm−/− mice with NAC treatment. 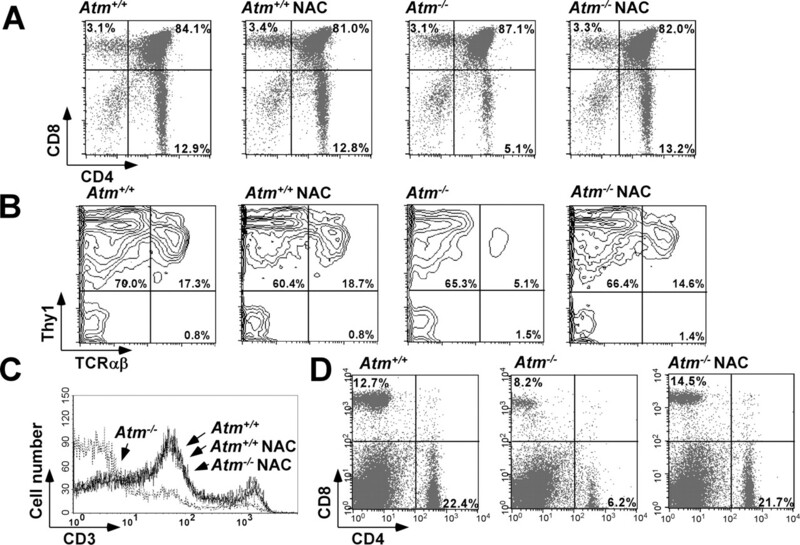 Restored elevation of ROS in Atm−/− thymocytes (A) and B cells (B) by NAC treatment. H2O2 levels were determined by DCF-DA staining in freshly isolated thymocytes or CD19+ cells (B cells) from spleen of WT and Atm−/− mice, with or without NAC treatment. Results are expressed as number of fold increase in intracellular ROS compared with WT cells without NAC treatment (n = 3). ∗, p < 0.01. 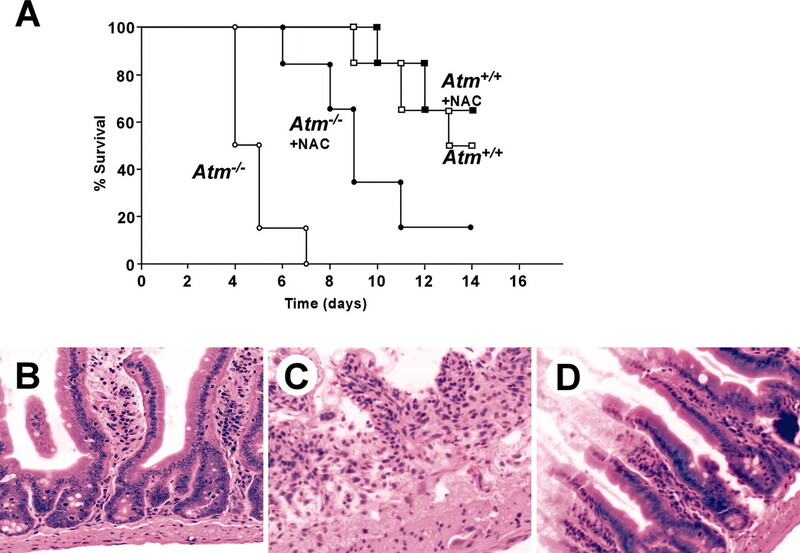 Prevention of tumorigenesis in Atm−/− mice by NAC. Kaplan-Meier survival curves are shown for WT and Atm−/− mice (n = 16 each group) administered 1 mg/ml NAC in their drinking water. These data prompted us to investigate effects of NAC on the development of pretumor lymphocytes in Atm−/− mice. It has recently been reported that Atm is required for efficient recombination between class switch regions of Ig genes, a process requiring regulated DSB repair (18, 23). We therefore analyzed the effect of ROS reduction on defective CSR seen in Atm−/− mice. CSR is required for production of IgG but not IgM. Accordingly, and consistent with previous reports (18, 23), levels of serum IgG1, IgG2a, and IgG3 in untreated Atm−/− mice were markedly lower than those in WT littermates (Fig. 5⇓A). However, in Atm−/− mice, NAC treatment in vivo dramatically restored serum IgG concentrations to WT levels. To investigate the intrinsic ability of Atm−/− B cells to undergo CSR in vitro, we examined the effect of NAC on in vitro secretion of Igs by splenic B cells cultured with various polyclonal B cell activators. Again, the IgM response of Atm−/− B cells did not differ significantly from that of WT B cells, with or without NAC treatment (Fig. 5⇓B). However, secretion of various IgG classes by Atm−/− B cells was impaired, and this defect was rescued by NAC treatment. 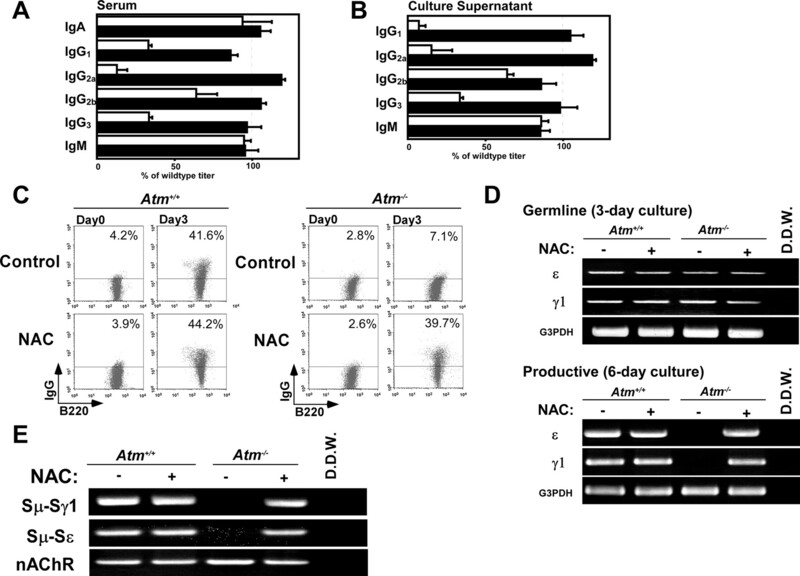 In addition, NAC treatment restored surface IgG1 expression to Atm−/− B cells (Fig. 5⇓C). There were no differences in in vitro clonal expansion of WT and Atm−/− B cells, with or without NAC (data not shown). These data demonstrate that ROS elevation in Atm−/− B cells results in an intrinsic defect in CSR in B cells. Restoration of impaired CSR in Atm−/− B cells by NAC. A, Rescue of specific Ig classes in serum. Serum samples from WT and Atm−/− mice, treated with or without NAC, were assayed for levels of specific Ig classes by ELISA. Data shown are the mean Atm−/− titer ± SD calculated as a percentage of the WT titer (n = 3). □, Serum from untreated Atm−/− mice; ▪, serum from NAC-treated Atm−/− mice. B, Rescue of specific Ig classes in B cell culture supernatants. CD19+ B cells were isolated from spleens of WT and Atm−/− mice treated with or without NAC. B cells were stimulated in vitro as described in Materials and Methods, and levels of specific Ig classes in culture supernatants were analyzed by ELISA. Data shown are the mean Atm−/− titer ± SD calculated as a percentage of the WT titer (n = 3). □, Atm−/− without NAC; ▪, Atm−/− with NAC. C, Rescue of surface IgG1 expression on Atm−/− B cells. Cultured B cells in B were harvested after 4 days of in vitro stimulation with CD40L and IL-4, and surface IgG1 was determined by flow cytometry. Numbers shown are the percentage of B cells that had undergone CSR expressed as a proportion of total B220+ B cells. D, Rescue of germline and productive Ig transcripts. Gene expression profiles of WT and Atm−/− B cells stimulated in vitro (as in B) were determined by RT-PCR analysis of total RNA. Germline and productive IgG1 (γ1) and IgE (ε) transcripts were measured on poststimulation days 3 and 6, respectively. Data shown are one trial representative of three independent experiments. D.D.W., Double-distilled water, G3PDH (PCR control). E, Rescue of CSR. Genomic DNA was isolated from WT and Atm−/− B cells activated in vitro for 6 days and analyzed for CSR from IgM to IgG1, and from IgM to IgE, by DC-PCR as described in Materials and Methods. PCR was performed using primers specific for the indicated recombined switch regions. nAChR, DC-PCR control. Data shown are one trial representative of three independent experiments. We next examined expression of germline (Gγ1, Gε) and productive (Pγ1, Pε) transcripts of Ig genes using RT-PCR. Germline and productive Ig transcripts appear before and after CSR, respectively. As expected, induction of Gγ1 and Gε transcripts peaked on day 3 in both WT and Atm−/− B cell cultures, with or without NAC (Fig. 5⇑D). However, expression of Pγ1 and Pε transcripts in Atm−/− B cells was markedly reduced compared with WT cells in the absence of NAC. Upon NAC treatment, expression of productive transcripts in Atm−/− B cells was restored. The PCR results were confirmed by a semiquantitative method (data not shown). To determine directly whether NAC treatment improves class switching by acting at the level of DNA recombination, we performed a DC-PCR assay to measure CSR directly in B cells. In B cells with normal CSR, the 5′ switch region DNA sequence for IgM (Sμ) is contiguous with the 3′ switch region for IgG1 (Sγ1) or the switch region for IgE (Sε) at the recombined IgH locus. To detect these fragments when Sμ and Sγ1, or Sμ and Sε, were present on the same DNA fragment, we amplified the switch regions using DC-PCR. This analysis revealed that Atm−/− B cells treated with NAC generated WT levels of both Sμ-Sγ1 and Sμ-Sε fragments, whereas CSR in untreated Atm−/− B cells was significantly lower than that seen in WT cells (Fig. 5⇑E). The PCR results were confirmed by a semiquantitative method (data not shown). These data demonstrate that regulation of ROS by Atm is required for efficient DNA recombination. We next determined the effects of NAC on T cell development in Atm−/− mice. Thymic cellularity in untreated Atm−/− mice (n = 5) was 41 ± 15% of that seen in WT animals. However, NAC-treated Atm−/− mice retained 83 ± 21% of WT thymic cellularity, suggesting a partial rescue. Flow cytometric analysis revealed a significant reduction in the percentage of CD4+CD8− T cells in the Atm−/− thymus (Table I⇓ and Fig. 6⇓A), indicating that Atm is essential for the differentiation of CD4+CD8− T cells from CD4+CD8+ thymocytes. With NAC treatment, the percentage of CD4+CD8− T cells in the Atm−/− thymus was comparable to that seen in thymi of untreated or NAC-treated WT mice. Although the proportion of Thy-1+ cells was relatively normal in the Atm−/− thymus, the loss of Atm resulted in a striking reduction in cells expressing either TCRαβ or CD3, an outcome reversed by NAC treatment (Table I⇓ and Fig. 6⇓, B and C). NAC treatment also normalized T cell populations in the Atm−/− spleen (Table I⇓ and Fig. 6⇓D). Thus, NAC treatment restored T cell development in Atm−/− mice. We then investigated chromosomal translocation seen in T cells from Atm−/− mice: an interchromosomal rearrangement between the TCRβ and TCRγ genes that predicts the onset of global chromosomal translocations in mouse thymocytes (20). TCRβ-TCRγ exchange was observed in thymocytes of Atm−/− mice (Fig. 7⇓). However, only a faint band of interchromosomal rearrangement was observed in thymocytes from NAC-treated Atm−/− mice, indicating that ROS elevation induces aberrant V(D)J recombination. These data demonstrate that Atm-mediated ROS regulation is essential for proper DNA recombination, preventing immunodeficiency and tumorigenesis. Restoration by NAC of T cell development in Atm−/− mice. Thymocytes or splenic T cells were isolated from WT and Atm−/− mice treated with or without NAC in vivo. Flow cytometry was performed to assess expression of CD4/CD8 (A) and Thy1/TCR (B) by thymocytes, of CD3 by thymocytes (C), and of CD4/8 by splenocytes (D). Numbers in quadrants are the percentage of total cells expressing the indicated markers. In each case, one trial representative of 10 independent experiments is shown. 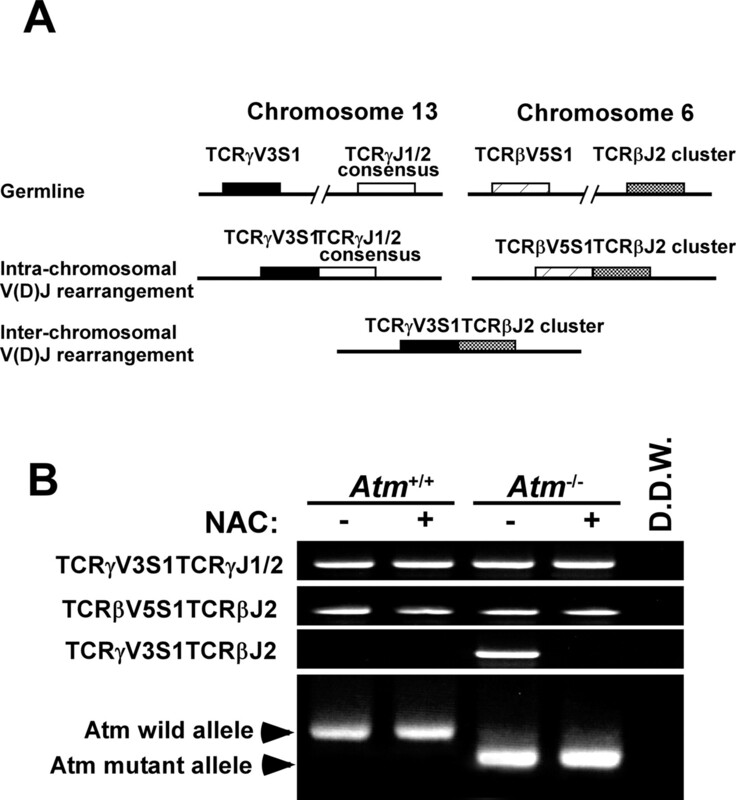 Prevention by NAC of aberrant TCR rearrangement in Atm−/− mice. Intra- and interchromosomal rearrangements were monitored by PCR in precancerous thymocytes from WT and Atm−/− mice treated with or without NAC in vivo. A, A schematic diagram of intra- and interchromosomal rearrangements in the TCRβ and TCRγ loci is shown in the upper panel. The TCRγV3S1TCRβJ2 rearrangement represents formation of a t (6 ,13 ) chromosomal translocation. B, Shown is representative genotypic PCR analysis of rearrangements shown in A in untreated and NAC-treated WT and Atm−/− cells. Atm WT and mutant alleles are also shown. Our data provide new insight into the role of ATM-mediated ROS regulation on physiological programmed DSB and repair contributing to lymphocyte development and prevention of tumor development. NAC treatment restored the potentially damaging effects of ROS on Atm-dependent TCR rearrangement and CSR. Why T cell development is defective in Atm−/− mice is unclear because it has been shown that ATM is not involved in the actual mechanics of V(D)J recombination (9, 10). Atm may be essential for survival of CD4+CD8+ thymocytes, and NAC-mediated inhibition of apoptosis of CD4+CD8+ cells may restore differentiation of mature T cells. However, another interesting possibility is that Atm may facilitate multiple, successive rearrangements in the TCR. Supporting this idea, introduction of a functional TCRαβ transgene can rescue defective T cell development in Atm−/− mice (24), suggesting that loss of Atm may result in a lower frequency of productive V(D)J recombination. Furthermore, it has been recently demonstrated that ATM is involved in DSB rejoining (25). Our results suggest that, in the absence of Atm, elevation in ROS results in defective DSB rejoining. Recently, a study regarding the effect of ROS on the function of the NHEJ-regulating gene, DNA-PKcs, was reported. Lu et al. (26) reported that ROS elevation inhibits expression and activity of DNA-PKcs, which is vital for NHEJ repair, and that NAC treatment rescued ROS-induced inactivation of DNA-PKcs. It has also been demonstrated that thiol-containing cysteine residues, which generally act at catalytic sites of enzymes, can be oxidatively modified by ROS (27). These observations suggest that ROS elevation in Atm−/− mice leads to defects in the fine-tuning of DNA recombination. Several studies have shown that ATM, 53BP1 (28, 29), and H2AX (30), although not essential for core NHEJ reactions, all function to prevent aberrant TCR rearrangement and faulty CSR. These molecules are believed to serve as “anchors” that block irreversible dissociation of unrepaired DSB during V(D)J recombination or CSR (31). Loss of ATM could lead to a defective anchor effect promoting aberrant rejoining of DNA fragments, particularly those at the TCR loci. Furthermore, it has been reported that Atm is required for suppression of activation-induced cytidine deaminase-induced c-myc-Igh translocation in B cells (32). Our data indicate that suppression of ROS by ATM is crucial for this anchor effect and thus for proper DNA recombination. Further study will be required to determine precisely how ROS affects the putative anchor protein complex. Tumors in Atm−/− mice with T cell lymphoblastic lymphomas exhibit abnormal chromosomal rearrangements at TCR loci (11), suggesting that lymphomagenesis in Atm−/− mice is driven by chromosomal aberrations that initiate during V(D)J recombination. Because thymic lymphomas in Rag2−/−Atm−/− or Rag1−/−Atm−/− mice, in which V(D)J recombination is inhibited, occur at a lower frequency and with a later latency compared with Atm−/− mice (33, 34), the implication is that at least the early onset of lymphomas in Atm−/− is caused by aberrant V(D)J recombination. Our data indicates that restored aberrant V(D)J recombination in pretumor lymphocytes by NAC contributes to prevention of the onset of lymphomas. Previous studies reported that the antioxidants, Tempol and NAC, increased the lifespan of Atm−/− mice by prolonging the latency to thymic lymphomas (15). However, the effects of these two agents are different in the development of lymphocytes. Tempol treatment reduced cell number of thymocytes and decreased weight gain in Atm−/− mice (15), whereas NAC restored the decreased T cell number but did not affect body weight in Atm−/− mice in our experiment. The different effects of these two agents are possibly due to their differing antioxidant activities. NAC is a source of sulfhydryl groups and is physiologically converted to metabolites capable of stimulating glutathione (GSH) synthesis. GSH peroxidase, in combination with GSH, converts H2O2 to water and molecular oxygen, as well as catalase. Although the precise mechanisms underlying abnormal ROS regulation by loss of ATM are still unknown, it has been reported that ATM regulates the intracellular redox state via modification of nuclear factor-erythroid 2-p45-related factor 2 expression, which is a key transcription factor regulating antioxidant enzymes (35). It has been reported that GSH synthesis is impaired in A-T cells (36). Catalase expression is also reduced in A-T cells (37). These data support the finding that NAC treatment robustly blocks phenotypes seen in Atm−/− mice. It has been also reported that NAC administration dramatically prevents tumorigenesis in p53−/− mice via suppression of ROS levels (38). Tempol is a stable piperidine nitroxide that acts as a genuine “SOD (superoxide dismutase) mimetic.” SOD is responsible for dismutation of superoxide radicals into molecular oxygen and H2O2. However, it has been reported that overexpression of Cu/Zn-SOD exacerbates radiation sensitivity and hemopoietic abnormalities of Atm−/− mice (39). The mechanisms for prevention of defective T cell development might be different between these two antioxidative agents. Furthermore, it is also suggested that NAC might mediate its effect through other mechanisms in addition to reduction of ROS, because NAC is known as a direct scavenger of ROS, but also as an indirect antioxidative agent, acting by increasing intracellular GSH (40). In conclusion, our data provide clear evidence that abnormal ROS regulation due to loss of Atm causes abnormal DNA recombination, resulting in immunodeficiency. The data suggest that treatment with antioxidants could greatly benefit A-T patients by preventing immunodeficiency and tumor development. Because A-T patients show hypersensitivity to irradiation, they have difficulties undergoing irradiation therapy for cancer. Use of NAC may allow those patients to tolerate radiation therapy. Our findings also contribute to a greater understanding of tumorigenesis and thus may advance the treatment of cancer. We thank P. J. McKinnon for providing Atm+/− mice, H. Saya, S. Matsuda, and K. Ikuta for helpful discussion, and A. Ono for technical support. ↵1 This work was supported by the Grant-in-Aid for Young Scientists from the Ministry of Education, Science, Sports, and Culture, Japan (to K.I. ), and Grant-in-Aid for Specially Promoted Research from the Ministry of Education, Science, Sports, and Culture, Japan (to T.S.). ↵3 Abbreviations used in this paper: A-T, ataxia telangiectasia; ATM, A-T mutated; IR, ionizing radiation; NHEJ, nonhomologous end-joining; DSB, double-strand break; ROS, reactive oxygen species; NAC, N-acetyl-l-cysteine; Tempol, 4-hydroxytetramethy-l-piperidine-1-oxyl; CSR, class switch recombination; MEF, murine embryonic fibroblast; DC-PCR, digestion-circularization-PCR; nAChR, nicotinic acetylcholine receptor; DCF-DA, 2′-7′-dichlorofluorescene diacetate; WT, wild type; SA-β-gal, senescence-associated β-galactosidase; GSH, glutathione; SOD, superoxide dismutase. Meyn, M. S.. 1995. Ataxia-telangiectasia and cellular responses to DNA damage. Cancer Res. 55: 5991-6001. Shiloh, Y., G. Rotman. 1996. Ataxia-telangiectasia and the ATM gene: linking neurodegeneration, immunodeficiency, and cancer to cell cycle checkpoints. J. Clin. Immunol. 16: 254-260. Savitsky, K., A. Bar-Shira, S. Gilad, G. Rotman, Y. Ziv, L. Vanagaite, D. A. Tagle, S. Smith, T. Uziel, S. Sfez. 1995. A single ataxia telangiectasia gene with a product similar to PI-3 kinase. Science 268: 1749-1753. Shiloh, Y.. 2003. ATM and related protein kinases: safeguarding genome integrity. Nat. Rev. Cancer 3: 155-168. Barzilai, A., G. Rotman, Y. Shiloh. 2002. ATM deficiency and oxidative stress: a new dimension of defective response to DNA damage. DNA Repair 1: 3-25. Barlow, C., S. Hirotsune, R. Paylor, M. Liyanage, M. Eckhaus, F. Collins, Y. Shiloh, J. N. Crawley, T. Ried, D. Tagle, A. Wynshaw-Boris. 1996. Atm-deficient mice: a paradigm of ataxia telangiectasia. Cell 86: 159-171. Elson, A., Y. Wang, C. J. Daugherty, C. C. Morton, F. Zhou, J. Campos-Torres, P. Leder. 1996. Pleiotropic defects in ataxia-telangiectasia protein-deficient mice. Proc. Natl. Acad. Sci. USA 93: 13084-13089. Xu, Y., T. Ashley, E. E. Brainerd, R. T. Bronson, M. S. Meyn, D. Baltimore. 1996. Targeted disruption of ATM leads to growth retardation, chromosomal fragmentation during meiosis, immune defects, and thymic lymphoma. Genes Dev. 10: 2411-2422. Pergola, F., M. Z. Zdzienicka, M. R. Lieber. 1993. V(D)J recombination in mammalian cell mutants defective in DNA double-strand break repair. Mol. Cell. Biol. 13: 3464-3471. Hsieh, C. L., C. F. Arlett, M. R. Lieber. 1993. V(D)J recombination in ataxia telangiectasia, Bloom’s syndrome, and a DNA ligase I-associated immunodeficiency disorder. J. Biol. Chem. 268: 20105-20109. Liyanage, M., Z. Weaver, C. Barlow, A. Coleman, D. G. Pankratz, S. Anderson, A. Wynshaw-Boris, T. Ried. 2000. Abnormal rearrangement within the α/δ T-cell receptor locus in lymphomas from Atm-deficient mice. Blood 96: 1940-1946. Kang, J., D. Ferguson, H. Song, C. Bassing, M. Eckersdorff, F. W. Alt, Y. Xu. 2005. Functional interaction of H2AX, NBS1, and p53 in ATM-dependent DNA damage responses and tumor suppression. Mol. Cell. Biol. 25: 661-670. Bredemeyer, A. L., G. G. Sharma, C. Y. Huang, B. A. Helmink, L. M. Walker, K. C. Khor, B. Nuskey, K. E. Sullivan, T. K. Pandita, C. H. Bassing, B. P. Sleckman. 2006. ATM stabilizes DNA double-strand-break complexes during V(D)J recombination. Nature 442: 466-470. Ito, K., A. Hirao, F. Arai, S. Matsuoka, K. Takubo, I. Hamaguchi, K. Nomiyama, K. Hosokawa, K. Sakurada, N. Nakagata, et al 2004. Regulation of oxidative stress by ATM is required for self-renewal of haematopoietic stem cells. Nature 431: 997-1002. Schubert, R., L. Erker, C. Barlow, H. Yakushiji, D. Larson, A. Russo, J. B. Mitchell, A. Wynshaw-Boris. 2004. Cancer chemoprevention by the antioxidant tempol in Atm-deficient mice. Hum. Mol. Genet. 13: 1793-1802. Reliene, R., E. Fischer, R. H. Schiestl. 2004. Effect of N-acetyl cysteine on oxidative DNA damage and the frequency of DNA deletions in Atm-deficient mice. Cancer Res. 64: 5148-5153. Kelly, G. S.. 1998. Clinical applications of N-acetylcysteine. Altern. Med. Rev. 3: 114-127. Lumsden, J. M., T. McCarty, L. K. Petiniot, R. Shen, C. Barlow, T. A. Wynn, H. C. Morse, 3rd, P. J. Gearhart, A. Wynshaw-Boris, E. E. Max, R. J. Hodes. 2004. Immunoglobulin class switch recombination is impaired in Atm-deficient mice. J. Exp. Med. 200: 1111-1121. Hirao, A., A. Cheung, G. Duncan, P. M. Girard, A. J. Elia, A. Wakeham, H. Okada, T. Sarkissian, J. A. Wong, T. Sakai, et al 2002. Chk2 is a tumor suppressor that regulates apoptosis in both an ataxia telangiectasia mutated (ATM)-dependent and an ATM-independent manner. Mol. Cell. Biol. 22: 6521-6532. Sekiguchi, J., D. O. Ferguson, H. T. Chen, E. M. Yang, J. Earle, K. Frank, S. Whitlow, Y. Gu, Y. Xu, A. Nussenzweig, F. W. Alt. 2001. Genetic interactions between ATM and the nonhomologous end-joining factors in genomic stability and development. Proc. Natl. Acad. Sci. USA 98: 3243-3248. Reliene, R., R. H. Schiestl. 2006. Antioxidant N-acetyl cysteine reduces incidence and multiplicity of lymphoma in Atm deficient mice. DNA Repair 5: 852-859. Reina-San-Martin, B., H. T. Chen, A. Nussenzweig, M. C. Nussenzweig. 2004. ATM is required for efficient recombination between immunoglobulin switch regions. J. Exp. Med. 200: 1103-1110. Chao, C., E. M. Yang, Y. Xu. 2000. Rescue of defective T cell development and function in Atm−/− mice by a functional TCRαβ transgene. J. Immunol. 164: 345-349. Riballo, E., M. Kuhne, N. Rief, A. Doherty, G. C. Smith, M. J. Recio, C. Reis, K. Dahm, A. Fricke, A. Krempler, et al 2004. A pathway of double-strand break rejoining dependent upon ATM, Artemis, and proteins locating to γ-H2AX foci. Mol. Cell 16: 715-724. Lu, H. R., H. Zhu, M. Huang, Y. Chen, Y. J. Cai, Z. H. Miao, J. S. Zhang, J. Ding. 2005. Reactive oxygen species elicit apoptosis by concurrently disrupting topoisomerase II and DNA-dependent protein kinase. Mol. Pharmacol. 68: 983-994. Michiels, C., E. Minet, D. Mottet, M. Raes. 2002. Regulation of gene expression by oxygen: NF-κB and HIF-1, two extremes. Free Radical Biol. Med. 33: 1231-1242. Ward, I. M., B. Reina-San-Martin, A. Olaru, K. Minn, K. Tamada, J. S. Lau, M. Cascalho, L. Chen, A. Nussenzweig, F. Livak, et al 2004. 53BP1 is required for class switch recombination. J. Cell Biol. 165: 459-464. Manis, J. P., J. C. Morales, Z. Xia, J. L. Kutok, F. W. Alt, P. B. Carpenter. 2004. 53BP1 links DNA damage-response pathways to immunoglobulin heavy chain class-switch recombination. Nat. Immunol. 5: 481-487. Reina-San-Martin, B., S. Difilippantonio, L. Hanitsch, R. F. Masilamani, A. Nussenzweig, M. C. Nussenzweig. 2003. H2AX is required for recombination between immunoglobulin switch regions but not for intra-switch region recombination or somatic hypermutation. J. Exp. Med. 197: 1767-1778. Bassing, C. H., F. W. Alt. 2004. The cellular response to general and programmed DNA double strand breaks. DNA Repair 3: 781-796. Ramiro, A. R., M. Jankovic, E. Callen, S. Difilippantonio, H. T. Chen, K. M. McBride, T. R. Eisenreich, J. Chen, R. A. Dickins, S. W. Lowe, et al 2006. Role of genomic instability and p53 in AID-induced c-myc-Igh translocations. Nature 440: 105-109. Petiniot, L. K., Z. Weaver, C. Barlow, R. Shen, M. Eckhaus, S. M. Steinberg, T. Ried, A. Wynshaw-Boris, R. J. Hodes. 2000. Recombinase-activating gene (RAG) 2-mediated V(D)J recombination is not essential for tumorigenesis in Atm-deficient mice. Proc. Natl. Acad. Sci. USA 97: 6664-6669. Li, B., X. Wang, N. Rasheed, Y. Hu, S. Boast, T. Ishii, K. Nakayama, K. I. Nakayama, S. P. Goff. 2004. Distinct roles of c-Abl and Atm in oxidative stress response are mediated by protein kinase Cδ. Genes Dev. 18: 1824-1837. Meredith, M. J., M. L. Dodson. 1987. Imparied glutathione biosynthesis in cultured human ataxia-telangiectasia cells. Cancer Res. 47: 4576-4581. Kamsler, A., D. Daily, A. Hochman, N. Stern, Y. Shiloh, G. Rotman, A. Barzilai. 2001. Increased oxidative stress in ataxia telangiectasia evidenced by alterations in redox state of brains from Atm-deficient mice. Cancer Res. 61: 1849-1854. Sablina, A. A., A. V. Budanov, G. V. Ilyinskaya, L. S. Agapova, J. E. Kravchenko, P. M. Chumakov. 2005. The antioxidant function of the p53 tumor suppressor. Nat. Med. 11: 1306-1313. Peter, Y., G. Rotman, J. Lotem, A. Elson, Y. Shiloh, Y. Groner. 2001. Elevated Cu/Zn-SOD exacerbates radiation sensitivity and hematopoietic abnormalities of Atm-deficient mice. EMBO J. 20: 1538-1546. Zafarullah, M., W. Q. Li, J. Sylvester, M. Ahmad. 2003. Molecular mechanisms of N-acetylcysteine actions. Cell Mol. Life Sci. 60: 6-20.